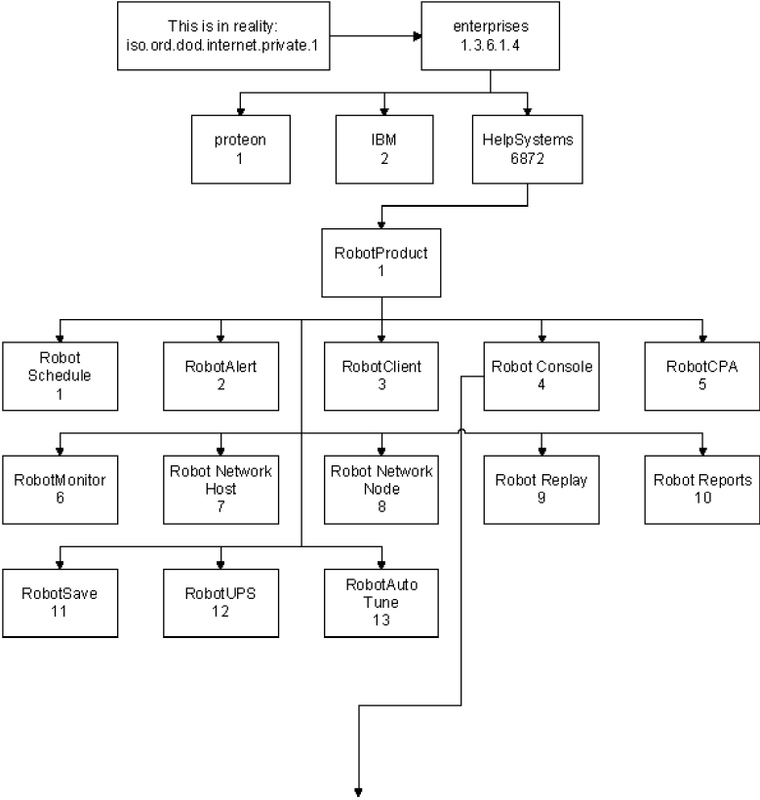 Robot Console manages IBM i messages and supports Simple Network Management Protocol (SNMP) traps. SNMP is a popular TCP/IP network management standard, supported by most UNIX-based and NT-based enterprise management tools. “Trap” is a generic term that refers to a software packet containing data (such as system messages), stored in a predefined data structure for interpretation and use by enterprise monitor software. 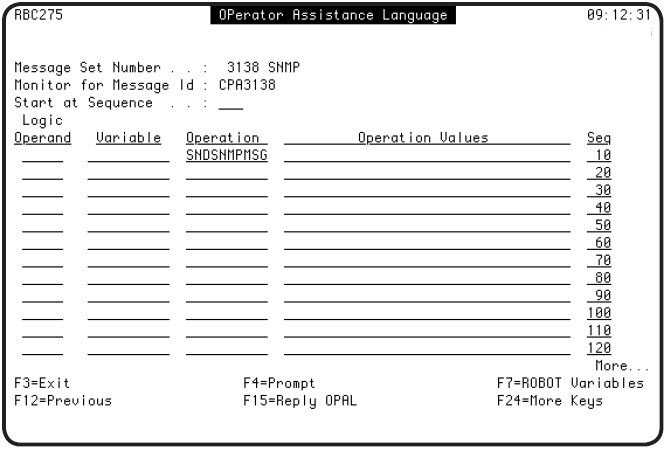 When messages occur on an IBM i, Robot Console can build an SNMP trap using the Robot Console Management Information Base (MIB) structure (see the figures on the following pages). Robot Console can create SNMP traps when it receives a message on the IBM i, or when a message has received a reply. The trap is passed to the enterprise monitor, which collects it, interprets its contents based on its copy of the Robot Console MIB structure, and displays it in a format determined by the site. This information allows the enterprise monitor administrator to take care of the problem, or pass the information to a knowledgeable source. This communication is one-way: events are sent to the enterprise monitor, but replies cannot be sent to Robot Console. In the background, Robot Console passes data to the enterprise monitor as a numeric sequence—1.3.6.1.4.1.6872.1.4.1, known as a MIB (Management Information Base) definition. Note: The IBM i SNMP Manager API also uses a field type identifier. A value of .1.0 or .2.0 should be appended to each field’s object ID to identify the field type as integer or character. You need the following prerequisites and software to install and use Robot Console with SNMP. Be familiar with Robot Console and SNMP. Have an IBM i communications expert available to help you implement this interface. Robot Console V3M28 or higher installed on your system. TCP/IP configured on your IBM i. We recommend you perform your installation and integration in the following order. The actual steps are detailed on the following pages. Install or update Robot Console on your IBM i. Use FTP to copy the Robot Console MIB data structure from your system to the SNMP enterprise monitor. Study the structure and incorporate it into your enterprise monitor (refer to the appropriate documentation for your enterprise monitor). Download the Robot Console MIB file, RBTSYSLIB/RSLMIB.RBCSMMIB, from your IBM i using the FTP command. Incorporate the Robot Console MIB structure into your enterprise monitor using the specific procedures for that enterprise monitor (refer to your enterprise monitor documentation). Compile the updated MIB structure file on your enterprise monitor. The first trap, type 0 (called rbcsmColdStart), is sent when the main Robot Console enterprise monitor communication program starts. This trap indicates that Robot Console is active and that communication lines are open between Robot Console and the enterprise monitor. The second trap, type 1 (called rbcsmSendTrap), is sent whenever Robot Console sends any message data to the enterprise monitor. This trap describes the contents of the data being sent. The enterprise monitor captures and displays the data from this trap according to your specifications when you incorporated the Robot Console MIB. The third trap, type 2 (called rbcsmReplyTrap), is sent whenever Robot Console sends a reply for the message data to the enterprise monitor. This trap describes the contents of the data being sent. The enterprise monitor captures and displays the data from this trap according to your specifications when you incorporated the Robot Console MIB. The following tables describe the traps in greater detail. Study these traps closely—you need to understand the information contained within them to determine how you plan to display their data on your enterprise monitor system. rbcsmColdStart None The Robot Console Enterprise Monitor interface subagent has connected to the IBM i SNMP agent. This trap is sent one time—when Robot Console initiates contact with SNMP. rbcsmSystemIdentifier The Robot Console SNMP subagent is providing message data. This trap is sent anytime Robot Console communicates message event information to SNMP. rbcsmReplyValue The Robot Console SNMP subagent is providing message reply data. This trap is sent anytime Robot Console communicates message reply information to SNMP. rbcsmSystemName 10 Char DisplayString System on which the message was received. rbcsmMessageCenterName 10 Char DisplayString Robot Console message center on which the message was received. rbcsmMessageQueueLibrary 10 Char DisplayString Library in which the message queue resides. 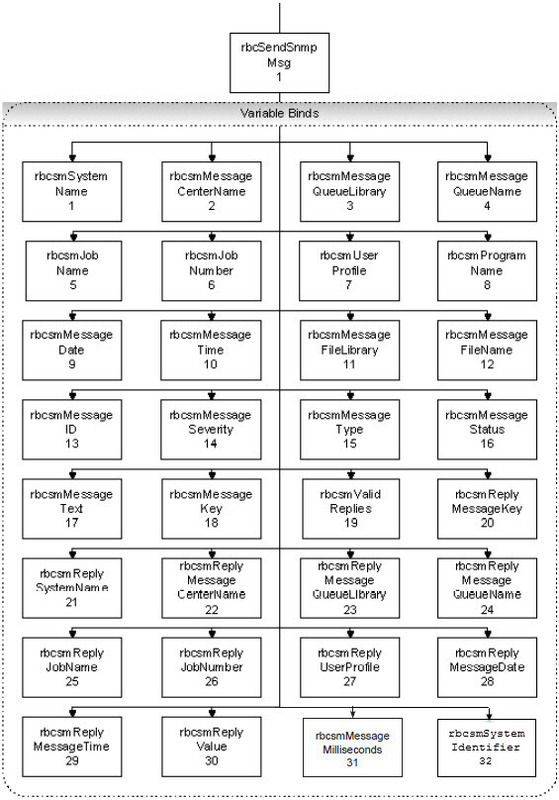 rbcsmMessageQueueName 10 Char DisplayString Message queue which received the message. rbcsmJobName 10 Char DisplayString Job name which the message came from. rbcsmJobNumber 6 Char DisplayString Job number which the message came from. rbcsmUserProfile 10 Char DisplayString User profile which the message came from. rbcsmProgramName 10 Char DisplayString Program name which the message came from. rbcsmMessageDate 8 Char DisplayString Date when the message was received (YY/MM/DD). rbcsmMessageTime 8 Char DisplayString Time when the message was received (HH:MM:SS). rbcsmMessageFileLibrary 10 Char DisplayString Library in which the message file exists. rbcsmMessageFileName 10 Char DisplayString Message file which defines the message. rbcsmMessageID 7 Char DisplayString IBM i message identifier. rbcsmMessageSeverity 2 Char DisplayString Severity of the IBM i messages (00-99). rbcsmMessageType 2 Char DisplayString IBM i message type. WT = Waiting for a reply. RS = Response required, waiting for a reply. MC = Received reply from the message center. MS = Received reply from the message set. OC = Received reply from outside of Robot Console. RA = Received reply from Robot Alert. rbcsmMessageText 1024 Char DisplayString Formatted message text. rbcsmMessageKey 4 Char DisplayString Message key. rbcsmValidReplies 160 Char DisplayString Valid relies for the message. rbcsmReplyMessageKey 4 Char DisplayString Message key being replied to. rbcsmReplySystemName 10 Char DisplayString System that answered the message. rbcsmReplyMessageCenterName 10 Char DisplayString Reply message center name. rbcsmReplyMessageQeueuLibrary 10 Char DisplayString Reply message queue library. rbcsmReplyMessageQeuueName 10 Char DisplayString Reply message queue. rbcsmReplyJobName 10 Char DisplayString Reply job name. rbcsmReplyJobNumber 6 Char DisplayString Reply job number. rbcsmReplyUserProfile 10 Char DisplayString Reply user. rbcsmReplyMessageDate 8 Char DisplayString Message reply date (YY/MM/DD). rbcsmReplyMessageTime 8 Char DisplayString Message reply time (HH:MM:SS). rbcsmReplyValue 132 Char DisplayString Message reply value. rbcsmMessageMilliseconds 6 Char DisplayString Time, in milliseconds, when the message was received. rbcsmSystemIdentifier 64 Char DisplayString User maintained system identifier used to uniquely identify system sending SNMP traps. Maintained using RSL900. trap_mgr_ip is the decimal IP address of your trap manager. translate_name specifies whether the community name should be translated to ASCII; usually *YES. When you create a message set, use the OPAL operation SNDSNMPMSG to send notification of a message to the Trap Manager. 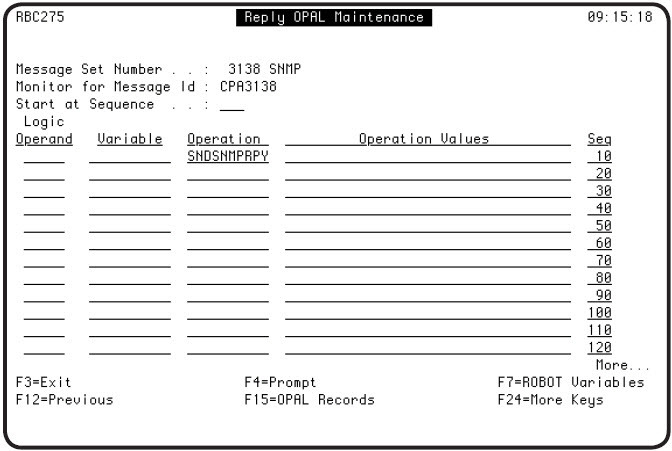 When you create a message set to forward the reply to the Trap Manager, press F15 to display the Reply OPAL Maintenance panel and enter the OPAL operation SNDSNMPRPY. Note: If you need to troubleshoot TCP/IP on the IBM i, enter the command NETSTAT. Select option 3 from the Work With TCP/IP Network Status menu to see the TCP/IP connection statuses. The normal status for SNMP should be equal to *UDP; it defaults to port 161. To verify this, press F14, Display port numbers.